As reported by The Next Web (TNW), many web developers will be happy at the news that these older browsers will be sent to the digital scrap heap. Supporting older browsers and their quirks adds extra hurdles/headaches to web development. From 12th January a Microsoft update KB3123303 adds a nag box to try and get those holding onto Internet Explorer 8, 9, and 10 to move along. Statistics indicate there are nearly 340 million people still using these older IE versions. However these people/organisations have had time to get used to the idea of migrating to IE11 or some other browser as Microsoft announced its deadline nearly 18 months ago. Hopefully these millions of legacy IE users will shift to something newer before getting zapped by vulnerabilities discovered after the browser EOL time. "After January 12, 2016, Microsoft will no longer provide security updates or technical support for older versions of Internet Explorer. Security updates patch vulnerabilities that may be exploited by malware, helping to keep users and their data safer. Regular security updates help protect computers from malicious attacks, so upgrading and staying current is important." As noted by ComputerWorld the oldest of next Tuesday's EOL trio, IE8, has been particularly 'sticky' with its Windows XP connection. 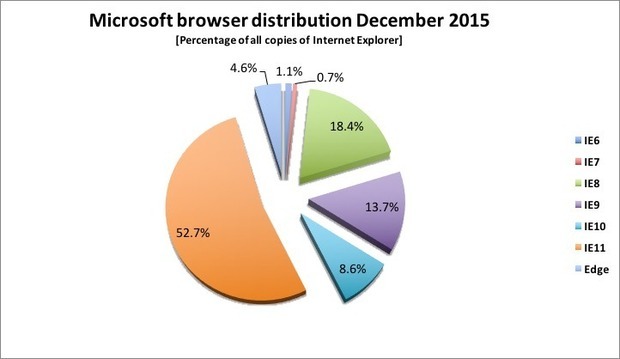 Microsoft would probably like all the legacy IE users to move to Microsoft Edge but figures show that despite the recent announcement of 200 million Windows 10 users and Edge being the default browser, only 37 million seem to use it for their web surfing. My IT training person keeps proudly announcing that we're moving to “Windows 11”. If she doesn't figure it out soon I'm going to pop a blood vessel halfway through a ‘training’ session. If Microsoft didn't have plans, or didn't want to support older version of IE they should never have integrated them so tightly with the OS. Actually in my department thay have added Chrome as an alternative browser. Can't say I'm 100% happy but at least when it comes to development I know the majority of functionality will work which is a good thing.